The closest approach that the moon will make on its monthly orbit around the Earth coupled with a Full Moon. The December 3rd Super Moon is here! 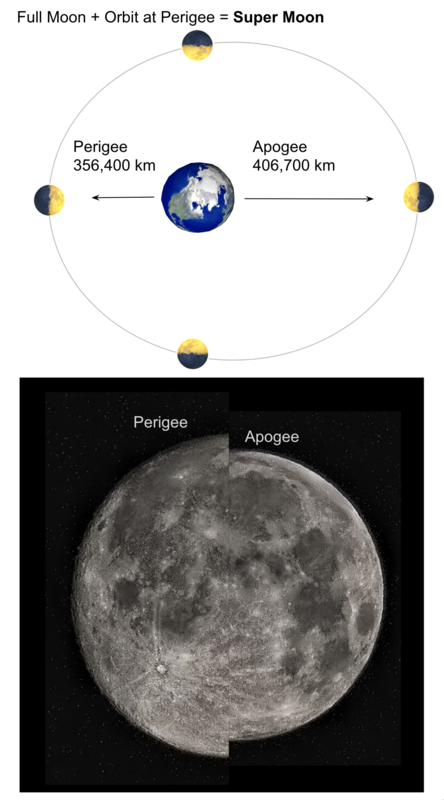 Here is an image showing how the arrangement of the Moon’s “Perigee” with the Full Moon results in the Super Moon. Schematic showing how the “Super Moon” happens and the change in apparent size of the moon. The Moon appears about 14% larger during a Super Moon event. The Full Moon + Orbit at Perigee = Super Moon.